United States Steel (USS) Great Lakes Fleet Inc.
Ultramar Shipping Co., Inc., New York - horizontal blue over yellow flag; on yellow "Ultramar" in blue; on blue a yellow eagle. As the name and homeport suggest, this is a barge line operating on the Mississippi-Ohio river system. The flag is (was?) a white pennant with the word "Union" in blue letters of diminishing size. I am reporting two flags flown from the ferry boat "Brooklyn", operated by the Union Ferry Company in the 1840s, at the time one of five ferry lines crossing between Brooklyn and Manhattan. They are from a painting from some time between 1846-49 by the identical twin painters James and John Bard, noted for their depictions of river craft around New York. I saw the painting in a black-and-white photograph in the book "Brooklyn's City Hall", by William J. Conklin and Jeffrey Simpson, Copyright 1983 by the City of New York. But the image is credited to the Long Island Historical Society, now known as the Brooklyn Historical Society. I imagine the painting is in their archive. As the photo was black-and-white, I was forced to chose dark blue as a reasonably likely color. This flag is very similar to that of the Fox & Livingston Havre Line, which was one of the three New York-to-Le Havre lines that were consolidated into the Union Line in the 1840s. It was eventually put out of business by the American Civil War. This flag is white with a black U and was in use by at least 1845. The Fox & Livingston Union Line flag was white with a blue U according to Private Signals of the Merchants of New York. I am somewhat skeptical that there were really two different flags, as the F&L line had been consolidated into the Union Line by the time the chart was published. This company was formed by the merger of the holdings of three partners who had struck oil northwest of Los Angeles in the late 19th century. The number "76" came into use as a trademark in 1930 and was placed on an orange circle, as shown in the latter two flags below, in 1947. Formed in 1890 by the merger of Hardison & Stewart Oil Company, Sespe Oil Company and Torrey Canyon Oil Company. In 1917 it purchased Pinal-Dome Oil company and in 1965 the Pure Oil Company. Shell bought 25% of the company and formed Shell Oil Corporation in 1922 to consolidate its operations and those of Union Oil Company of Delaware in 1922. Union Oil became Unocal in 1983. Sources: Wedge (1951), Stewart (1953), US Navy's 1961 H.O. This was apparently the first flag of the company's tanker fleet, which consisted of 8 ships as of 1949. It was blue with a white lozenge bearing the initials U.O.Co. (as shown) or, in a variant, U.O.C. Source: Styring (1971), a distinctive design of diagonal blue and white stripes with the orange 76 logo superimposed. Source: photo of house flags in dining hall at US Merchant Marine Academy, Kings Point, apparently from the late 1970s, white with the word Union in blue lower case letters, the 76 on an orange disk forming the letter o. Union Oil Co. of California. Going by Lloyds the shipping stayed under this name until they got out around 1998 with the last couple of tankers now operating [in their old names] under Crowley Petroleum Transport Inc. According to Loughran (1979) the blue and white diagonally striped flag was adopted in 1966 on the 76th anniversary. This company was formed in New Jersey in 1896 and had operations all up and down the U.S. east coast, but primarily in mining the sulphur domes along the Louisiana and Texas coasts in the midst of oil country. It later got into the oil business as well, specializing in extracting the sulphur from sour crude and selling both products. It was operating its own ships by 1920. Union Sulphur became Union Sulphur and Oil in 1950, Union Oil and Gas in 1955, and Union Texas Natural Gas in 1960 before merging with Allied Chemical Company in 1962. The flag (as I said, my favorite of the whole set) is perfect for a sulphur company, as it simply reeks of brimstone--yellow with a red devil brandishing a black pitchfork. This large shipping company was essentially the plaything of the W. Averell Harriman, son of E. H. Harriman of the Union Pacific Railroad, whose name will be familiar to fans of the film "Butch Cassidy and the Sundance Kid." It was financed by Averell's mother as a way for him to make his mark in business independent of his father--an interesting concept when Mom's providing all the cash! Harriman's timing wasn't the best, as he entered the passenger shipping business just when immigration laws were tightened, ending the great flow of immigrants of the previous 40-50 years. He also got taken to the cleaners in a joint venture with the German firm HAPAG, which was determined to recover from the German defeat in the first World War, and whose owners had vastly more experience in the shipping business than young Averell. Several million of his mother's dollars later, Harriman sold what was left of UAL to HAPAG. He learned from the bitter experience of UAL, however, and subsequently enjoyed considerable success in international trade, although he did not go back into shipping. He later entered politics and diplomacy, becoming governor of New York and later U.S. ambassador to South Vietnam. He is best remembered today as the last husband of the socialite, Democratic Party fundraiser, and U.S. ambassador to Paris, Pamela Harriman. His choice in flags was unfortunately less adventurous than his choice of brides: the white letters UAL on a blue field. The pre-World War I American Line and the United States Lines, although with no direct corporate lineage, were both eventually owned by the International Mercantile Marine holding company and so ended up with the same house flag. 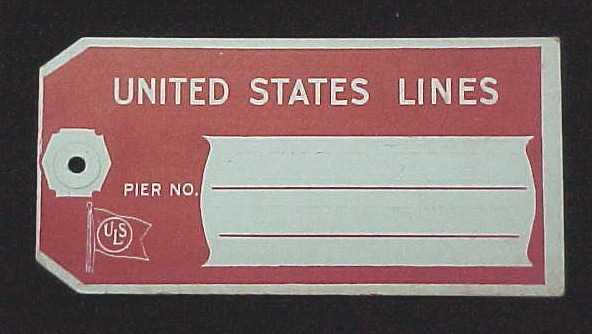 The United States Lines was originally created by the US Shipping Board to operate German liners confiscated in World War I, including the huge HAPAG liner Vaterland, which was renamed Leviathan. 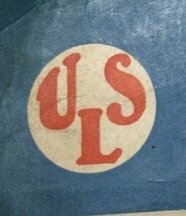 Larousse Commercial Illustr� (Paris, 1930) shows a flag of the United States Line, New York, as a blue swallowtail, a white disk near the hoist bearing red letters ULS (with serifs), the L placed lower than the others; the U and L have a definite upward slant. Different from what is shown above. Source URL http://www.nvo.com/louisvuitton/vintageluggagelabels/list.nhtml, item VL#28 is no longer available, but the image is posted here. The flag is shown by Brown 1929 although in their case the bottom of the "L" is positioned horizontally. By the dates of the sources, if the version existed or was proposed, then it would appear to have been a replacement for the initial flag. These are the colors, position, etc of the USL house flag from late summer of 1929 through spring of 1929. The flag was changed then and again in 1931 after the IMM/Roosevelt group bought it. See also: reports of flags in the 1920s bearing a propeller. This "similar flag" can be seen at http://www.timetableimages.com/maritime/images/ppl.htm (last image, brochure issued July 1940). In 1937, IMM abolished the American Merchant Line and merged its assets into the United States Lines. At this point, the initials were removed from the flags and the simple blue eagle on white of the pre-war American Line was restored. Eventually, IMM decided that "United States Lines" had a better public resonance than "International Mercantile Marine" and arranged for the parent company to be swallowed up by the subsidiary. For the rest of its history, US Lines was the premier shipping company operating under the United States flag, both the largest and the most prestigious. Its flagship, the United States, was the biggest passenger ship ever built in the US and the fastest ever. But it never turned a profit, and a combination of losses from passenger service and slowness to embrace containerization for its freight services put the company in serious financial trouble by the late 1960s. It recovered briefly but went back into the red in mid-1980s and was forced into bankruptcy and liquidation in 1986. The name "United States Line" has since been purchased by a company that is running cruises under that name, but I don't know if they are also using the old USL flag. From the website of the National Maritime Museum, "the house flag of the United States Lines Co., New York. A white rectangular flag, printed in blue with the American eagle, 'UNITED STATES LINES' below. The flag is made of nylon fabric. It has a cotton hoist and is machine sewn." Joe McMillan made several images of this shipping line, none of which resembles this one. The flag was produced c. 1951, perhaps a special flag? Two flags are reported for the periods 1921-29 and 1929-1931, both images by Joe McMillan, 26 August 2001, who reported that during its initial years, the line was operated directly by the US government and used a bureaucratic LOB for a house flag, featuring a steamship propeller inside a triangle inside a circle containing the name of the line. The company was sold in 1929 to Paul W. Chapman, a financial speculator, as part of privatization of the lines created by the Shipping Board. The only change in the flag was the addition of a red star in the canton. Unfortunately, private ownership turned out to run a less efficient operation than the USSB, and the Shipping Board was forced to resume ownership in 1931 to save the company from bankruptcy. United States Lines. The flag shown for 1929-1931 is only an assumption because Bonsor does not mention any lettering or propeller. The 1931-1938 version is shown by Brown 1934 as having a black eagle and letters which colouring can probably be disregarded although Loughran (1979) also shows the same. Whilst it may represent a subsequent change to a plain blue eagle, which all sources agree with, it seems more likely to be a confusion caused by a dark shade of blue. USL never featured a propeller on its flag. Its first flag (between 1921 and 1929) featured a white disc with red letters USL on a blue background and a very different design but not on white between 1929 and 1931. Note that the information here referring to a propeller came from a book about Atlantic merchant shipping entitled North Atlantic Seaway. That was a verbal description, on the basis of which I drew the images concerned. I have not found any direct evidence that it was used as a flag, but the logo described in the book is presumably the one that appears at the bottom of this poster for SS Leviathan. Not a propeller, but the authors of the book could easily have mistaken it for one. Redrawn images based on the description in North Atlantic Seaway and using the SS Leviathan poster as a design base are posted for the 1921 and 1929 flags. The two flags originally supplied by Joe McMillan are sourced from the "North Atlantic Seaway" of 5 volumes by N.R.P. Bonsor. Bonsor is, as far as I am aware, regarded as a very reliable source, and there is a great volume of information and detail included in this publication and within such a mass of detail it is possible that errors might be contained therein. Details of flags, unfortunately for those with different areas of interests, usually comes in a poor second to details of the ships themselves. Bonsor is the only source I have found for the two flags which he gives for the period from the start in 1921 until the 1931 change of ownership and the first which he gives for 1921-29 I agree is suspect with the blue flag bearing the white circle and the red letters "USL" being supported in the publications "Almanacco Marine Mercantilli" of 1925, "Brown's Flags & Funnels" 1929 and "Larousse Commercial Illustr�" of 1930 [these may have originated from a common source but at least its existence is indicated from that period]. Further supports are found in timetables, etc., including a 1922 timetable at http://www.timetableimages.com/maritime/images/usl.htm and I would refer anyone interested to consider the cap badge at http://amhistory.si.edu/onthemove/collection/object_1004.html which is given for the creation of the line in 1923 [opposed to the 1921 date given by other sources] and used until 1929. Mark Goldberg has given the use of the "USL" lettered flag as being from the late summer of 1929 to the spring of 1929 [is the opening year correct?] which fits in with other sources that there was a change in 1929 when the line was acquired by Paul Wadsworth Chapman whose spell was very brief as he lost it in 1931 after getting into financial difficulties. But there is indication that, as Mark says, the original flag was altered in 1929 and then again in 1931 when sources agree that the first "eagle" flag was hoisted. It seems definite that a new logo was designed in 1929 as can be seen on a poster at http://www.theroyalcourt.info/the-us-lines.html. Also in support is the cap badge shown at http://amhistory.si.edu/onthemove/collection/object_1003.html. The only reference I have been able to find for a flag of any sort for this period is the preamble to a part of an article in Time Magazine 22.4.1929: "On the hurricane deck of the S. S. Leviathan in Manhattan last week stood a 15-year-old girl in a dark sailor blouse, a white canvas hat and black shoes and stockings. To the mainmast peak she, Joanna Chapman, ran up a small triangular flag picked out with the letter Y. Her father, Paul Wadsworth Chapman, handed a $4,000,000 check to Chairman T. V. O'Connor of the U. S. Shipping Board. The biggest shipping deal in U. S. history thus completed, the Leviathan's personnel was cut 10% and away she sailed with 1,398 passengers..." (http://content.time.com/time/magazine/article/0,9171,751835,00.html). The rest of the article I cannot access but the reference to the "Y" makes me wonder whether it refers to the logo and the theory that the triangle contained a white 3 bladed propeller is a misinterpretation. I suspect therefore that the flags detailed by Bonsor [words only, there are no images so any drawings made are only artist's interpretations] have a connection with this 1929-1931 Chapman period. To have changed advertising logos and crew cap badges, not to mention tableware as I have it noted down that the logo appeared on a butter plate for around the same period, and not also have made an actual flag when dealing with a passenger vessel like the "Leviathan", would to me seem to be strange in that a flag would help advertise identity to prospective customers. However why Bonsor has given details of two flags is a mystery. If there were two and he has only assumed that they fit the dates of ownership then maybe they are connected with Chapman and his business activities whatever they were. According to the "Historical Dictionary of the US Maritime Industry" he had founded his own firm in 1912 and post WW1 was involved with public utilities organizing the Hoboken Shore Railroad and forming the Community Water Service Co. and Union Utilities Inc. so a flag for any of these may have been the origin with the second flag of Bonsor then being allocated to his take over of USL. The last is but a wild stab in the dark but with the evidence of the logo being in use between 1929 and 1931 I feel that the writing off of the Bonsor flags is premature until evidence can be produced of what flag, if any, was flown by "Leviathan" and her fellow ships. I have located a further similar source for the first flag shown by Bonsor i.e. this is white with the blue annulet inscribed "UNITED STATES LINES" enclosing a red delta triangle frame wholly charged with a red "Y" or heraldic pall in line with the cap badge. It is shown in "The Atlantic Ferry in the Twentieth Century" by F. Reid Corson. There is no date of publication for the book but the chapter covering the USL activities records the 1929 takeover by Chapman, which was agreed to February 14th, and specifies that details are "at the time of writing (September 1929)" [Page 131]. The flag can be seen flying at http://www.nd.edu/~scollin4/Michigan03.htm#sault (third image down), which shows from left to right, this flag, Algoma, Interlake, Inland Lakes Mgt, and Canadian Steamship. The flag is divided horizontally, black above white, and has a red triangle near the hoist (a �Czech� pattern). 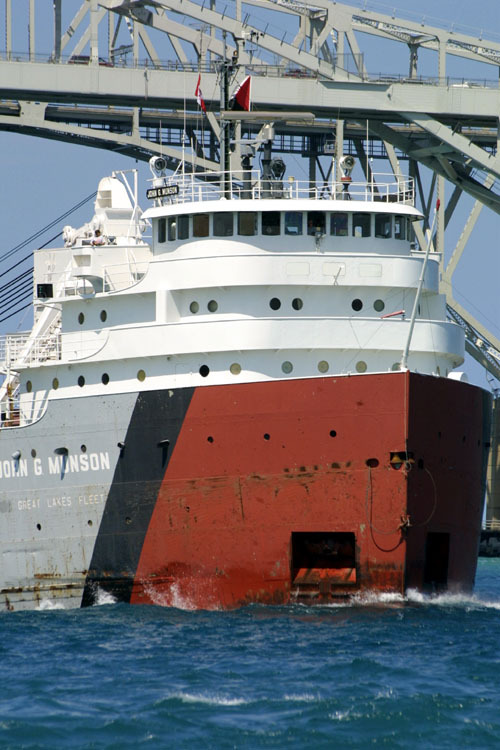 It seems also to wave on this US Steel ship, the �George A. Sloan�: http://www.wellandcanal.ca/shiparc/uss/georgeasloan/sloan4.htm. Shortly after my report I stumbled upon an American eBay offer, item no. 7373226822 (ended 17 Dec. 2005) showing a similar flag. Quote: �This house flag measuring approximately 7 feet 9 inches long by 4 feet 7 inches wide was used by the Great Lakes Fleet (ex-USS Fleet) on its Lake freighters. The flag is made form high strength nylon and is in absolutely pristine condition. Its condition would indicate that it may never have been put into service. It was purchased in Duluth, MN in the 1990�.� The flag is also shown on the flag chart. Why this flag was used is a bit of a mystery which I am trying to unravel at the moment. There was a funnel marking at one time which used a kind of version of the flag as a panel but following threads on the boatnerd website I cannot find any mention of this but there is reference to a light blue flag with "USS" within a ring in either grey or silver being the US Steel flag and appearing on cap badges and being flown by ships as well as outside their HQ (28.4.2009 - see http://www.daylife.com/article/0a06eM5aqmb54?q=Cisco+Systems%2C+Inc), which is said by a boatnerd thread to have been adopted in the 1960s though seen as a rectangle rather than a swallowtail as shown on the cap badges. 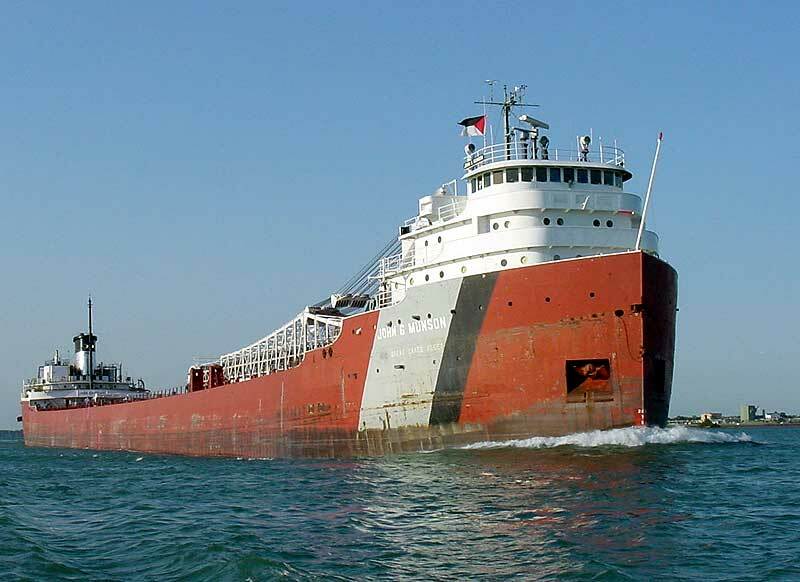 Incidentally the Know Your Ships 2007 which is the last one I got showed that the Great Lakes Fleet was flying the flag of the managers Key Lakes Inc. so the "Czech" style flag may have gone. US Steel was the owner of the company, during that time they used the blue with white USS flag which is still flow at the USS steel mills and office locations. When Transtar was formed they moved all the transport companies (rail roads and the Great Lakes fleet) under their control. That is when they used the black red and white flag. It represents the coal, iron ore, and limestone the Great Lakes fleet carried. When US Steel sold off various parts of its transportation companies CN bought it and placed it under Key Lakes to remain in compliance with the Jones Act, they now fly the Key Lakes house flag. In 1967 Us Steel merged the Bradley transportation, and the Pittsburgh steamship together and renamed it USS Great Lakes fleet. 1988 is when they fell under Transtar and in 2001 it was sold to CN Rail. From the home port, obviously a Great Lakes company, but no further information. Flag white with a red oval bearing the company's initials in white. George B. Upton, Boston, is one of the house flags carried by Donald McKay's Clippers.